Over the past few weeks I have received a number of emails on the status of the Distressed Debt Investors Club. And because I have not provided an update here for sometime, I thought I would take a few minutes to talk about the amazing success of the site. As noted before, we have capped the limit of users to 250, with an unlimited number of guests. Currently, nearly half the member spots have been filled with well over 1000 guests logging onto the site. For reference, we are receiving 5-15 applications a week for full membership and admitting 2-4 of those same applications (this number has been declining as the number of available spots decreases). For those that are interested, I would encourage you to join as a guest member to see the quality of ideas on the site (when asked for idea synopsis / text just write in guest) For more information on applying, please read the FAQ. In terms of ideas, we have well over 100 ideas fully written up on the site. The diversity of ideas is simply amazing. For example, in the past week we had a member write-up a long thesis on Visteon's equity and the same week another member wrote-up a short thesis on Visteon's equity and bonds. Ideas range from full blown Chapter 11 distressed, to stressed high yield investments, to event-driven equity longs, and finally to equity shorts. While I have not fully run the numbers, I would estimate that 90% of the ideas presented to the site have generated positive absolute returns. One of the main reasons I set out to develop the site was to develop a platform where smart, dedicated analysts and portfolio managers could share ideas with one another to develop a culture of alpha generating security selection where all incentives were aligned. By joining, members have access to a plethora of actionable ideas and research, while at the same time adding to the collection of ideas through the application process. I have always been wary of sell side and desk analyst recommendations as you do not know if a broker or dealer is talking up an idea to move inventory. Here, each member realizes that XYZ member pitching ABC credit probably has a position, and thus can better judge the situation at hand. Further, because ideas are rated by the community of analysts and portfolio managers on the site, and each member's idea recommendation history can be easily pulled up, it is in every member's best interest to submit their best ideas on the site to avoid being labeled someone simply out to talk his or her book. Finally, and what I have been most surprised about, is the success of our message board where members discuss ideas more informally and talk about general macroeconomic and thematic concepts (for example, there is a recent thread on the China real estate bubble and how to play it). We also have a job board which I am fully ramping in the next few months with the help of some outside partners. Overall, I have to say the success of the site has fully exceeded my expectations. We continue to add features to the site and have a number of interesting developments in the pipeline. If you have any questions, please feel free to email me (hunter [at] distressed-debt-investing [dot] com). I hope to see you on the site soon. This would be the second CLO launch of the year. Combined with the $525M CLO placed by Fraser Sullivan earlier in the year, and this $500M Symphony deal, CLO issuance will reach the $1 billion dollar mark, with more deals expected in the second half of the year. Compared to the chart above, that $1 billion dollars looks awfully minuscule. According to various news reports, this CLO will purchase new deals, and given the current state of the primary market, will have a substantial amount of supply to choose from. The AAA tranche will be $317M in size, $113M to a Class B tranche (rated Ba2 from Moody's) and $70M in equity notes. In addition, it is reported that the AAA tranche will be held by one investor. Given the $70M of equity versus the $430M of debt, this deal will be slightly more than 6.1x levered versus 2006 and 2007 structures which were 12-13x levered. While I have not heard hard data on the potential for equity returns in the structure, it is rumored that they will somewhere in the low-mid teens which is slightly less from what equity investors were told they would earn in the go-go years (2004-2007). If you were to show the most recent data, these levels would be even tighter. While investors have varying preferences for investing in legacy CLO liabilities or new CLO liabilities, it is readily apparent that the market is in far better shape than it was at this time last year. Assuming investors can place the subordinated tranches of these structures, it seems likely that we will see more of these structures announced throughout the year. 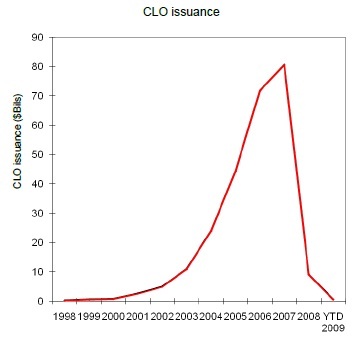 There has been substantial consolidation in CLO manager land which further bolsters the case that CLO liability investors will become comfortable with the less levered, more modest 2010 CLO vintages. 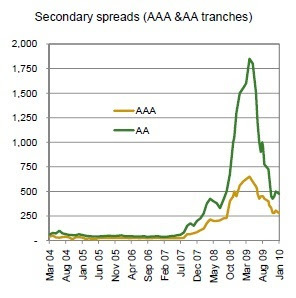 And given that AAA liabilities are pricing near L+200 vs L+40 in 2007, investors are surely being paid a premium to play in these structures. What this means for buy-side investors? More competition in the primary leveraged loan market where most deals today are already well oversubscribed. Also - more capital available for refinancing troubled borrowers or busted LBOs. The last thing this market needs is more capital - unfortunately, I think that is exactly what we are about to get. A pivotal aspect of distressed debt investing is the negotiations among opposing (read: warring) creditor factions. Senior creditors may want one thing, but subordinated bond holders want another. Sometimes people throw the "cram down" rule as a gauntlet in negotiations when in fact they may not even have the necessary stipulations as required by 1129 of the bankruptcy code to cram down a dissenting creditor class. Many of these negotiations are worked out behind the scenes - when evaluating an investment in a bankrupt creditor, it is prudent to play out all likely scenarios to see where ultimate recovery will come out. This exact situation is playing out in Tribune's bankruptcy proceedings. Some background: Last week, Tribune announced it had come to an agreement between Centerbridge, J.P. Morgan and certain other senior secured lenders that would enable the company to file a plan and possibly emerge from bankruptcy. Under the settlement, Centerbridge and other pre-LBO senior debt holders would receive 7.4% of the cash, debt, and equity of the reorganized debtor's distributable enterprise value. The catalyst for this settlement was Centerbridge and other creditor's assertion that the LBO was effectively a fraudulent conveyance. On the news, the bank debt traded up a couple of points. To note, in the marketplace, a settlement was widely expected and in my opinion the bank debt traded up due to the 7.4% distribution being slightly lower than the 10% thrown in the market running up to the announcement. This is where things get interesting. I have embedded the full response below. The ad-hoc lenders, which I listed in a previous post, and include some pretty big names in distressed debt are saying: "Nope. This won't do." And because they represent 42% of the bank debt, people should listen. From reading the document, it is readily apparent their main issue is that there are far too many releases being granted in exchange for nothing. Further, the bank group, via their post-re org equity interests, would fully indemnify Sam Zell, Tribune's directors and officers, the bank debt arrangers, etc. Everyone wins except the bank debt holders. The ad-hoc lenders are asking the court to end exclusivity so that they themselves may file their own plan of reorganization (this will be their third attempt). Their plan looks to either shut down Centerbridge's claims of fraudulent conveyance by filing a "subsidiary only plan" (see above document for explanation). They also consider setting up a litigation trust among other actions which may allow the company to exit bankruptcy quicker as the company could emerge from bankruptcy and the litigation trust could deal with causes of action relating to the LBO. After the close today, Tribune filed its own plan. We will find out soon enough where the direction of the case is headed because also filed tonight on the docket is the Amended Agenda of Matters Scheduled for Hearing on April 13th, 2010 at 10:00AM (tomorrow). Item 14: Debtors' Motion for an Order Pursuant to 11 U.S.C. 1121 (d) Further Extending Debtors' Exclusivity Period ... Responses Received: The above docket I have embedded. We do not know which way the judge will rule in this one. If the ad-hoc group holds itself together (I am sure J.P. Morgan will be working the lines to work people over to their side), I do not see how the current plan gets confirmed. I have to think either settlement gets renegotiated. We will see though. Will be an interesting day in court. A few months ago, we took some time out to profile Third Avenue's Focused Credit Fund. We were particularly impressed with some of the commentary coming out of the manager's letter. As a side note, if you work at Third Avenue, can you please shoot me an email (hunter [at] distressed-debt-investing [dot] com). Have a question. We thought we would check in and see if Third Avenue's managers had released more commentary, and we were please what we found their 2010 First Quarter Report (yes - I know this came out at the end of January...don't shoot the messenger). While subsequent events at the company largely support our thesis (a thesis developed with our colleagues on the Third Avenue credit team), the investment continues to face a number of hard-to-handicap risks, chief among them: i) operational risk (hurricane season starts in June! ); ii) political risk (uncertainty related to how the Obama administration might change the industry tax regime or rules on access to reserves); and iii) deal risk (the possibility that significant new leverage is introduced as the result of either a debt-financed acquisition or a takeover of the company by a highly leveraged acquirer). Readers active in the distressed debt market will know Energy XII was a hot topic. And given where those notes are trading right now, the investment looked like it paid off. Let's move on to the credit team's commentary. And as discussed in previous posts here: Lots of capital is flowing to the distressed space: The Credit Fund's assets grew from $280M to $545M at the end the quarter. Their performance slightly lagged the Barclays HY Index and CSFB Leveraged Loan Index due to a position in Blockbuster's Senior Secured Notes (a hotly discussed topic on the Distressed Debt Investors Club site) and high cash balances. Market returns were led by CCC-rated issues which returned nearly two times the index return in the most recent quarter. This included a number of higher-risk Finance company bonds. The Finance sector had the highest return in the high-yield index for the quarter, with a return of 9.25%. For many of the Finance sector bonds that performed well, Fund Management determined there was not adequate information or transparency available on specific companies to be able to obtain a high enough conviction level that there would be minimal downside risk. These bonds included AIG, ILFC, Rescap, Aiful, Takefuji, as well as several hybrid/perpetual preferre stocks of U.S. and European banks. We view this market pullback, which has continued into February, as constructive and a good opportunity for us as investors. As we have said in the past, “Trees don’t grow to the sky” and this is especially true in the credit markets. It seems that investors are finally paying attention to thefundamentals and capital structure of specific companies since the rally in the credit markets began in March 2009. In general, during this rally, the riskiest securities benefitted the most. Returns on CCC-rated high-yield bonds exceeded 100% in 2009, despite the fact that many of these companies have over-leveraged balance sheets and their cash flows from operations have declined meaningfully. Risk appetites for these types of companies appear to be diminishing. Companies that report disappointing earnings or have uncertain outlooks have seen their security prices decline recently. This is the type of market we favor and believe we can excel in – it is what we call a “Credit Picker’s” market. We believe that investors should be invested with a manager that focuses on credit selection and carefully measures the upside potential versus downside risk of each security, as opposed to investing with a manager that just buys the riskiest securities in hopes that they will increase. Apparently they were also caught off guard on how fast the market snapped back in March. I tend to agree - that this is the kind of market where the wheat is separated from the chaff. Especially given how volatile the market feels when you are trading it (i.e. in the morning you will not be able to buy a bond, bad news comes out, and then you would not be able to sell the bond in the afternoon). Credit selection is so important in a market like this. From reading their commentary, they believe that returns for the next few years should be moderately positive but investors should not look to 2009 as a barometer for returns going forward. And as noted in previous posts on this blog, the refinancing wall of 2012-2014, despite being worked down in past months, still is a monstrous number to the tune of $600-$700B. Due to hurricanes which disrupted production in the Gulf of Mexico and the collapse in commodity prices, EXXI ran into liquidity issues. During the fourth quarter, EXXI attempted to do a debt exchange whereby it would exchange approximately 50% of its $625 million 10% Senior Notes for new 16% second lien secured notes at a price of 80% of par. Additionally, EXXI planned to retire the $125 million in 10% bonds the company had purchased to reduce its overall debt load. Based on our proprietary research, we determined that EXXI’s oil reserves more than covered the value of its debt at par and the 10% notes were trading in the low 80 dollar price range. When we discussed the rationale for the debt exchange with management, they said there were two key reasons. First, it would reduce slightly its overall debt. Second, they wanted to modify the “Change of Control” provision in the new 16% second lien notes so it would be different than the 10% Notes. A “Change of Control” provision is standard in high-yield bonds and provides that if a company is bought out by another company, then the bondholders can force the company to repurchase their bonds at a price of 101% of par. EXXI wanted the flexibility to be able to issue more than 50% of their outstanding common stock in a new acquisition deal. This would have triggered a “Change of Control” in the 10% notes. This led us to conclude that management wanted to do an acquisition funded with almost all equity, in order to substantially reduce its ratio of debt to equity. If this happened it would positively impact the bonds. We purchased the 10% senior notes and agreed to the debt exchange. Following the debt exchange, the combination of the new notes traded at a higher price than our cost basis. In November 2009, EXXI announced that it was purchasing interests in oil properties from Mitsui & Co. for $283 million. These are interests in oil fields that EXXI already owns and operates. They were able to negotiate a favorable purchase price and will incur almost no additional operating costs. EXXI then completed an equity and convertible bond offering to fund the entire transaction. EXXI owns interests in two deepwater exploration fields being drilled and operated by McMoran. Our analysis attributed no value to these fields, since there was no discovery yet but they were drilling the wells and had incurred costs. In January, EXXI and McMoran announced favorable findings for one of these wells. The stock now has a market capitalization of $1 billion and the 10% and 16% notes we own now trade at par and 115% of par, respectively. The following is a list of Third Avenue Focused Credit Fund’s 10 largest issuers and the percentage of the total net assets each represented, as of January 31, 2010: Swift Transportation, 4.2%; Energy XXI Gulf Coast, Inc., 3.8%; CIT Group, Inc., 3.0%; TXU Corp., 2.9%; Lyondell Chemical Co., 2.9%; Pinnacle Foods Finance LLC, 2.8%; First Data Corp., 2.7%; FMG Finance Ltd., 2.7%; Georgia Gulf Corp., 2.5%; and Culligan International Co., 2.3%. I know most of these names well and will try to write up a snippet about each in the coming weeks. I will note, that a lot of these names have run substantially since Jan 31st. Overall, very strong distressed debt commentary out of the Third Avenue's Credit Team. In the distressed debt world, it is helpful to know who you are up against and who's side you are playing for in a particular deal. But how do you find this information out? Let's use Tribune as an example. Tribune has been a favorite of the event driven / distressed hedge fund space for over 2 years now. Let's say you are interested in investing in the bank debt but want to get up to speed by talking to other investors you may know that already hold the position. I goto the docket, and start poking through filings that could shed some light. You are looking for things like "Statement of Representation" which is just a fancy way to say XYZ legal firm is representing ABC Creditor. In Tribune, the first thing that pops up when searching starting with the most recent documents is Docket #3927. ...3. HBD and YCST represent a number of individual creditors in connection with holdings of indebtedness governed by the Credit Agreement, dated as of May 17, 2007 (as amended, the “Credit Agreement”), by and among Tribune, each lender from time to time party thereto, and certain financial institutions as administrative agent, syndication agent, codocumentation agents, and joint lead arrangers and joint bookrunners. 4. The names and addresses of the creditors currently represented by HBD and YCST (collectively, the “Lenders”) are identified on Exhibit A, attached hereto. The aggregate principal amount of claims held by the Lenders against the Debtors currently totals approximately $3.8 billion. In the above text, HBD and YCST stand for two legal firms: James O. Johnston, on behalf of Hennigan Bennett & Dorman LLP (“HBD”), and M. Blake Cleary, on behalf of Young, Conaway, Stargatt & Taylor, LLP (“YCST”). And read that again - The creditors listed hold $3.8B of the claims. That is a big number. The file continues by listing the lender (with addresses). Here are some the names on the list. Avenue Special Situations Fund IV, L.P.
Avenue Special Situations Fund V, L.P.
KKR Strategic Capital Holdings I, L.P.
SEG Latigo Master Fund Ltd. So just eyeballing it: Avenue, Canyon, Contrarian, Franklin Templeton, Goldentree, Knighthead, Luxor, Oaktree, Onex, Scoggin, Taconic, Viking, and York are in the mix. That is a strong list of solid hedge fund names. Unfortunately, these filings don't tell you where these assets were being bought. But if you know someone at one of these places, you could make a call, get a summary of the situation, and you are off to races. I am very grateful for all the help I receive from guest writers, as well as our readers who have made this all possible. In the coming months we have some big plans for our various sites. Here is to hoping a second year of successes!